New for 2019! Since the first use of tie-bars, a common misconception is that the tie bars should be mounted betweeen the drives using the ear-type ene-cap mount. 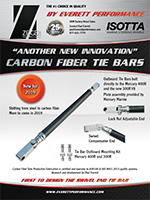 This configuration will only last so long because is causes the tie-bar to twist and will likely cause it to break! Not so with the patented Zeiger tie bars. Ours are designed to swivel, not twist. New for 2019! Since the first use of tie-bars, a common misconception is that the tie-bars should be mounted between the eye-type end-cap mount. This configuration will only last so long because it causes the tie bar to twist, which will likely cause it to break! 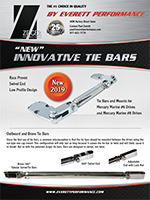 Not so with the patented Zeiger tie bars. Ours are designed to swivle, not twist. New for 2016! Finally a stainless steel upgrade far over and above the standard old black plastic rubber boot style tilt helm offered today. 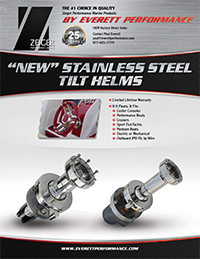 A true innovation manufactured with precision, Zeiger Performance Marine is the first to design a tilt system for mid-range and high-end boats. Easy to install & precision fit to Seastar, Dan Foss, and CharLynn valves.